Sportswear designed for pregnant women can reduce ‘bump bounce’ by half – even when running. In comparison, expectant mothers who wore specialist fitness gear, which can cost up to £60 for leggings, saw movements of just 3.8cm. The study is the first to test specialised pregnancy sportswear against standard fitness clothing sold on the high street. The team of biomechanic researchers, led by Professor Joanna Wakefield Scurr, has for years tested breast bounce in bras for lingerie manufacturers and the military. But this was the first time they have been asked to test clothing’s ability to reduce the bounce and movement of a pregnancy bump during exercise. Her colleague, Sophie Rej, who carried out the tests behind the study, said: ‘Fitness wear is an evolving market. ‘And new maternity fitness wear brands are emerging to meet the changing needs of a woman’s body during pregnancy. ‘Our tests on FittaMamma specialist maternity fitness wear reduced bounce of the bump in all directions by 48 per cent. The clothing did not have an effect on women’s balance, joint movement or muscle activity, according to the results which were not published in a journal. Exercising during pregnancy is safe for babies and can cut a woman’s chance of needing a Caesarean section by a tenth, said researchers last July. Mothers-to-be who do gentle exercise such as aerobics, walking or using a bike machine, and eat a healthy diet are more likely to deliver their baby naturally, suggested evidence from 12,500 women in 16 countries. Around one in four births in the UK are by Caesarean which, although regarded as very safe, can carry a risk of complications. These include infections in new mothers, excessive bleeding and potential damage to surrounding organs. There are also risks to the baby, include breathing problems, although these usually improve within a few days. 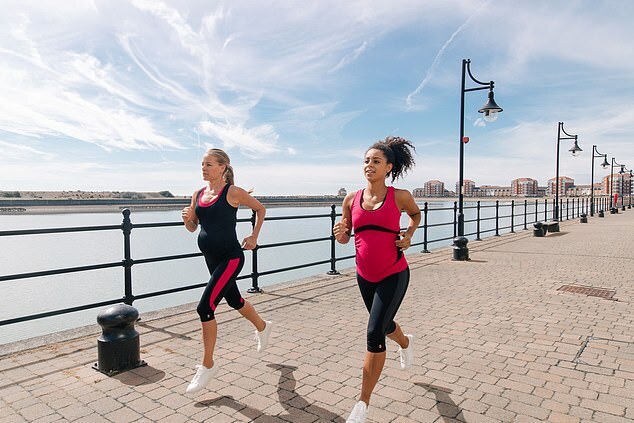 The Royal College of Obstetricians and Gynaecologists advises that pregnant women do up to 30 minutes a day of aerobic exercise – such as running, swimming or dancing. But the Royal College say women should not expect to be as fit as they were before the pregnancy, and should stop exercising as soon as they feel unwell. Previous research has shown that while nearly half pregnant women take some form of exercise, very few do enough to meet health guidelines. NHS guidelines recommend all healthy pregnant women should aim for 30 minutes exercise on at least five days a week to benefit themselves and their baby. However, the intensity, duration and frequency of exercise all tend to tail off or stop altogether for most women once they’re in their second trimester. Pregnancy can cause lower back ache and pelvic girdle pain. Supporting the bump and reducing the amount of bounce can alleviate this. The co-founders of Sussex-based FittaMamma, Deborah Hazeldean and Alexandra McCabe, described the results as being ‘wonderful’. Ms McCabe said: ‘It fully vindicates what we believed, and we are hoping this will empower more women to keep exercising through their pregnancies. ‘The benefits of staying active are compelling and it’s a dreadful shame so many women stop exercising once they become pregnant. The four women taking part in the study were four-five months’ pregnant and their average age was 32. In a series of experiments, they were asked to stand, walk briskly and run while wearing the FittaMamma clothes or the ‘standard’ wear. The standard wear the women were asked to exercise in consisted of Blooming Marvellous leggings and a tank top from H&M. All of the women had taken part in some form of exercise before becoming pregnant and most were keen to continue. The participants rated the level of support for the back provided by the FittaMamma clothes at 8.25 out of 10, compared to 3.5 for the ‘standard’ fitness wear. Support for the hips and pelvis scored 8.75 for the specialist gear, compared to 3.25 in the comparison vest and leggings. Following the experiments, all four of the women said they felt more confident when their bump was supported.